Last Wednesday, you could almost hear the deafening cheers from Wall Street investors as the Dow Jones Industrial Average surpassed 20,000 for the first time ever. In 120 years of turbulent history, it has never before managed to come close to this level. Do not be fooled by Mr. Market. Look back at the not-so-distant history of March 30, 1999. This was the day that the Wall Street Journal heralded the dawn of a new era as the Dow blew past 10,000 for the first time in history with its “Dow Industrials Top 10,000.” This then-record high occurred on March 29, 1999. It lasted for all of eight and a half months. By January 14, 2000, the Dow and other market indices had reached their inevitable peak. From this point on, a bloodbath ensued over the next two years. An eye watering $5 trillion of wealth became erased from the ledgers of investors the world over. These new lofty levels of the Dow should give you plenty of pause for thought. Whether or not you believe a severe market correction is long overdue or not, you should at least consider that buying stocks when they are overpriced is the single worst mistake you can possibly make in investing. Regardless of how amazing the investment may appear, when you pay too much, you are asking for trouble. How do you know stocks are so overpriced now? It is more than the recent record of 20,000, which only 10 years ago sounded more like science fiction than actually possible. It is the fact that the price to sales ratio is the highest it has been in 15 years at least. Some scary food for thought is that this ratio is actually massively higher now than it was before the last devastating crash in 2008. Consider the Price to Earnings ratio as well. This cyclically-adjusted level today stands at its highest amount since the dot com crash after 2000, which is also higher than before the 2008 market crash. Ditto for Enterprise Values to EBITDA which measures the operating cashflow of a corporation’s principal business. It would be naive to believe that U.S. stocks will simply continue to rise forever. History tells us what happens when investors start to believe that. A better choice is to invest in markets where there is opportunity remaining. Many overseas markets are now far more attractively priced. Goldman Sachs just announced that European stock markets have twice as much potential and room to rise as do American equities’ markets. Their Price-to-Book ratios are significantly more attractive than are their American peers. Even Japanese corporations are flush with cash (more than any exchange-listed companies in any rival nation) and starting to pay higher dividends and do more share buybacks. This is true while their stocks are at comparatively cheap prices when measured against American equities. As for the debt levels of Japanese companies, they boast the strongest balance sheets on earth. Compare this to American companies which are overburdened with simply years of built-up debts. Value investing remains among the most successful strategies in the markets over the past 50 years. Is Your Retirement Portfolio Ready for the Inevitable American Stock Market Crash? Stocks never rise in a straight line. History has proven time and again when they irrationally get ahead of themselves, they come crashing back down. This was the case in 1987, 2000, and 2008. We are long overdue for a severe pullback, especially given the new all-time highs which are based on only speculation and hope. When the markets do inevitably fall back down, gold will once again prove to be the smartest asset class in which to have moved at least some of your retirement assets. As this chart demonstrates, from the years of 2000 through 2010 when the stock markets crashed and burned not once but twice, gold prices rose from around $250 per ounce to approximately $1,400 per ounce. The yellow metal will protect you again in the next stock market retrenchment. You can safely rely on its hedging power for your portfolio. 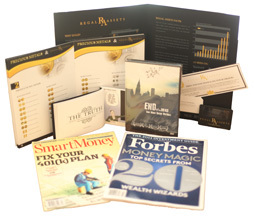 Request your free and no-obligation gold IRA rollover kit now from Regal Assets by clicking here to learn everything you need in order to protect your assets by a partial allocation to physical gold.